As executives embrace the concept of getting work done during meetings (rather than afterwards), boardrooms are transitioning from being presentation environments to collaborative spaces where everyone is encouraged to share their ideas, manipulate documents, and finalize content. At a technological level, this dictates the need for intuitive displays, as well as systems that deliver good quality sound—especially since today’s meetings usually involve not only those who are physically present in the space, but also audio and video callers who are working off site. Here are several examples of recent executive boardroom and briefing center projects that illustrate how these spaces are transforming into venues where everyone gets their say. The Orlando, Fla., office of national AV design and integration firm CCS Presentation Systems (headquartered in Scottsdale, Ariz.) recently integrated an Audio-Technica ATUC-50 Digital Discussion System into the University of Central Florida (UCF), also located in Orlando. The system is used for meetings of the institution’s Board of Trustees, and was designed to support a sort of boardroom environment on-the-go, since these quarterly events take place in a number of different locations on campus. To achieve this, the university’s AV team has housed the technology in a road case, which expedites set-up and tear-down. Last year, the French AV design and integration firm Abaques Audiovisuel completed a boardroom for the Conseil National de l’Ordre de Pharmaciens (CNOP), France’s professional association representing the country’s pharmacists. Used for meetings covering highly confidential matters, the room required a multimedia conferencing system featuring microphones, electronic voting capabilities, and paperless document management. The challenge: integrating all of this technology into a Paris-based site that’s registered as a historic building. Media Vision, an audio equipment provider headquartered in Oakland, Calif., called upon its French office to work with the architect, integrator, table manufacturer, and the end user to develop a solution that would fulfill modern-day meeting requirements while respecting the aesthetics of the space. The end result is based on a TAIDEN HCS-8338 multimedia conference system, featuring 44 TAIDEN HCS-8348 Multimedia Conference Terminals with 10-inch touchscreens, line array microphones, cameras, electronic voting functionality, document management, and VOD. The system also includes an HCS-8316HDMI Encoder, an HCS-8300KMX Congress Gigabit Network Switcher, as well as HCS-8200 Series Software Modules for the management of the mics, electronic voting, audio recording, video, and documents. Media Vision says that this was France’s first TAIDEN installation. Sprint recently overhauled its executive briefing center (EBC) in an effort to update its technology and give both employees and visitors a slicker meeting environment. The company worked with Prysm Inc., a cloud-based digital workspace solutions developer headquartered in San Jose, Calif., and SKC Communications, an audiovisual design and integration business based in Kansas City, Mo. One of the main issues with Sprint’s existing EBC was that it was built on-the-round, like a theater. To the executives involved in the renovation project, this meant that visitors would feel like they were attending a lecture, rather than participating in a group discussion. The company wanted to change this dynamic and create a space that promoted engagement and collaboration. For example, in the retrofitted space, executives now use a control console to run meetings so that they could easily maintain eye contact with visitors. A 50-foot curved video wall serves as the centerpiece of the newly redone 2,300 square foot rotunda. The wall is made up of 120 Prysm Laser Phosphor Display (LPD) tiles and minimal bezels, and both Sprint employees and visitors use these interactive displays to share and develop content. The technology eliminates the need for users to access a desktop, since they may conduct all of their content sharing via touch. Prysm argues that solutions like these address the transformation that is taking place in executive briefing centers, whereby meeting participants aren’t simply listeners, but collaborators as well. In Sprint’s case, the curved, interactive video wall enables room occupants to make use of every aspect of the space, making real discussion and exchange possible. 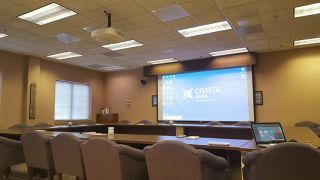 Improved audio quality was the main goal behind a recent project at Civista Bank’s main meeting room at its headquarters in Sandusky, Ohio. The space, which can be separated into two rooms when necessary, is used for board meetings, teleconferencing, and loan reviews. Prior to the upgrade, the space’s users noted that the audio quality was poor, especially during conferencing. Civista called upon ProVideo Systems, an AV design and integration company based in Perrysburg, Ohio, to oversee the integration of new audio capture technology. The team had already installed Shure microphone systems into the space; this time around, engineers specified three Shure Microflex Advance MXA910 Ceiling Array Microphones based on their reliability and flexibility. Flexibility was crucial in this application in fact, largely because the physical space can be divided into two meeting rooms. Two Shure MXA910s serve the larger of the two spaces, while one MXA910 unit suffices for the smaller space. ProVideo engineers configured the systems so that when both rooms are in use, meeting participants are not bothered by audio spillage between the two spaces. Additionally, the AV team at ProVideo had a noisy HVAC system to contend with, and the Shure technology’s steerable lobes and EQ preferences assisted them in setting up a system that produces clear audio quality so that meeting participants can hear, and converse with, each other properly. When a leading financial firm decided to move their annual client meetings to their office building, they knew they needed to upgrade their AV. “This company requires a cutting edge AV system that matches the quality of their services,” said Advanced vice president Mark McPherson. His AV integration firm was tapped by a leading financial firm—which will remain anonymous in this editorial coverage—to envision, design, and install a massive AV system upgrade. This project would outfit the company’s executive boardroom, auditorium, conference room, classroom, and four meeting rooms with next-gen AV. “We delivered a stunning, yet easy-to-use presentation system that each employee can truly rely on,” McPherson said. For the firm, consistency across all of the building’s systems was key. That’s why the integration team installed SMART interactive displays and the Crestron AirMedia Presentation Gateway into the executive boardroom, conference room, and four meeting rooms. Equipment used included a Crestron AirMedia Presentation Gateway, Draper Access screens (165” and 222” models), NEC 65" LED display for large-scale presentations, SMART interactive displays, and a Sony 7000-Lumen Laser Light Source Projector. Stroll down the isle of any Home Depot and it’s a safe bet you will see at least a dozen products bearing the Rust-Oleum name. The global company’s paint and coating product line spans the professional, industrial, automotive, and residential markets. Last edition we brought you into the Rust-Oleam headquarters. In case you missed it, here’s a snapshot of an exciting application of AV technology. As the company grows, Rust-Oleum had to convert former conference rooms at its Vernon Hills, Ill., headquarters into offices. That left their headquarters lacking in dedicated meeting space. When a nearby restaurant went up for sale, the company bought and renovated it as its new meeting center, once again illustrating how to leverage opportunities to solve problems. The 8,000-square-foot building was reinvented into five new meeting spaces: three rooms seat eight to 20 people; one seats 40 people; and a large room that accommodates 100 people. “Our culture is about making it easier for employees to work. That means giving them access to facilities that encourage people to meet and get products to market quicker,” said David Heald, manager of client services and systems engineer at Rust-Oleum. Working with AV system designer and integrator Sensory Technologies, the Rust-Oleum team took a closer look at some of the wireless microphone options available. They said that Revolabs’ Executive Elite stood out from the pack.